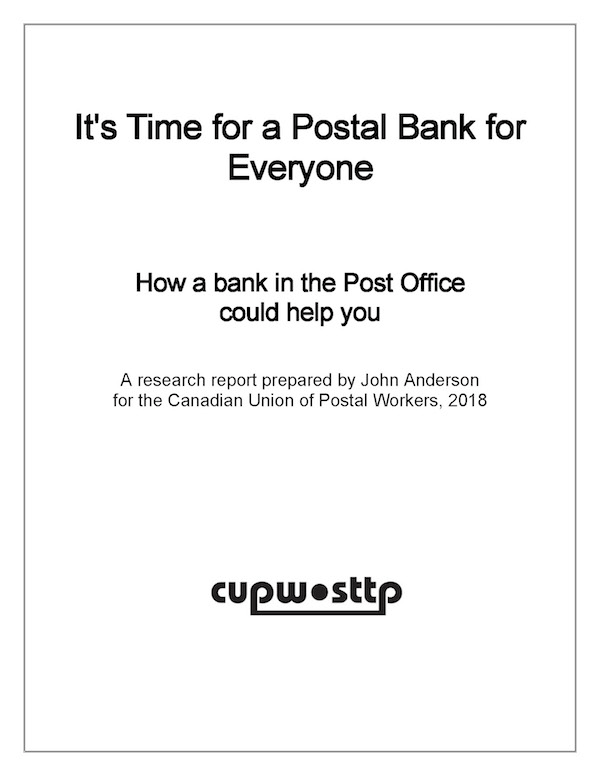 Postal workers' unions — the Canadian Union of Postal Workers (CUPW) and the Canadian Postmasters and Assistants Association (CPAA) and more than 600 municipalities(1) and other allies are supporting the set-up of postal banking and making financial services available in every post office. This report recaps the case for postal banking, and shows how clear the path is for its implementation in Canada. Postal workers' unions — the Canadian Union of Postal Workers (CUPW) and the Canadian Postmasters and Assistants Association (CPAA) and more than 600 municipalities 1 and other allies are supporting the set-up of postal banking and making financial services available in every post office. This report recaps the case for postal banking, and shows how clear the path is for its implementation in Canada. A. Why do we need it? Many Canadians no longer have access to a bank or credit union. Many communities now have no banks or credit unions at all. A study showed in 2014 that 45 percent of small towns and rural communities with a post office did not have any bank or credit union. British Columbia and Nova Scotia had rates above 60 percent, and Newfoundland above 80 percent! Existing banking services are very expensive for most people and a postal bank could offer very affordable services while still making a profit. The average monthly fee levied on chequing account plans rose by 13.6 percent from 2005 to February 2013. 6 Fees for chequing accounts with unlimited transactions range around $16-30 per month at the major banks. 7 This means many people are paying $360 a year for basic banking services! Cheaper plans are available but charge extra for many services or for using basic services multiple times. Most Indigenous communities do not have a bank or credit union. While there are over 700 Indigenous communities in Canada, there are only about 66 bank or credit union branches in these communities. That means less than 10 percent of Indigenous communities have a bank or credit union branch. A Canada Post bank could work with Indigenous communities to offer banking services in their communities. Figures are from the September 2017 websites of the major banks and credit unions. But does anybody still use branches? Don't we do it all online? One argument used against starting a postal bank is that nobody uses a bank branch anymore. But the reality is that people still need bank branches. A study from the Canadian Credit Union Association showed that over 50 percent of Canadians still use a bank or credit union branch on a regular basis. We need an alternative to pay day loans. Payday loan rates are usurious. At the lowest rate in Canada – which is now in Ontario – a $100 loan at $15 interest over two weeks still amounts to an annual interest rate of 391 percent! Yet pay day loans are only accorded to people who have a reliable income source. Thus, a new postal bank could offer alternative products to pay day loans at similar rates to credit cards, which at their most expensive are under 30 percent. For example, a 29 percent rate would cost about $1.11 over two weeks instead of $15. Banking services help support other post office services such as mail service, home delivery, and local post offices. Mail delivery is itself an important service in a large country like Canada where the cost of mailing a letter 9,300 kilometers (the width of Canada) is the same as mailing one to a recipient in the same town. Also, home delivery which has been cut needs to be re-expanded and this requires revenues from multiple sources. Postal banking revenues have proven to be valuable in many countries, as the following chart shows. B. How would it work? C. What services would be offered? First, basic banking services such as savings and chequing accounts and bill payment. It could then build to other services such as mortgages, business and personal loans, foreign exchange, investments, insurance and alternatives to payday loans. D. What do the Post Office and the federal government know about banking? Canada Post has had 100 years of banking experience. Postal banking in Canada was introduced in 1868 right after Confederation and lasted until 1968. The legislation that enabled postal banking is still on the books. Canada Post already delivers some financial services at its 6,200 plus offices, the largest retail chain in Canada. It sells money orders, credit cards and has an on-line bill delivery service, epost, which could easily be modified to allow bill payment on-line. Canada Post already has a secure delivery system in place, which can be further developed. Canada Post already has trained staff who can learn how to deliver new financial functions to support banking services. The federal government already administers four very successful banks, all of which made profits totaling $3.2 billion in 2016. These banks could provide support for the new postal bank as they already have 242 offices across the country, provide loans to farm families and businesses as well as offer savings products such as Treasury Bills, and until recently, Canada Savings Bonds. Staff expertise from over 7000 public servants could be seconded to the new postal bank. E. Who would pay for it? 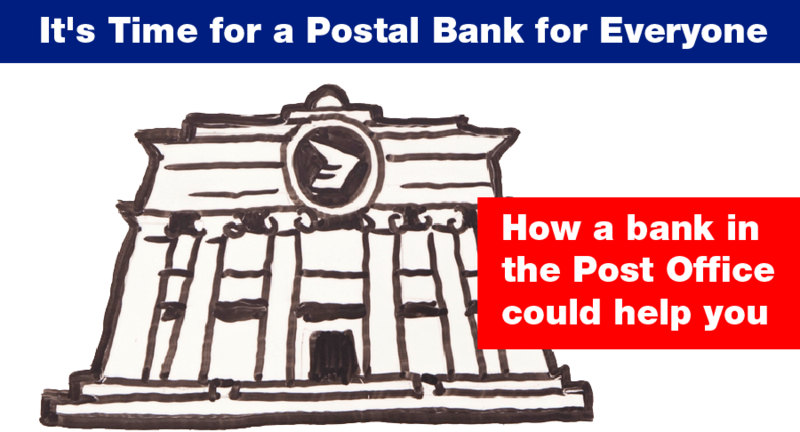 While a new postal bank would require initial investments from the federal government, Canada Post already has the bricks and mortar offices as well as the staff – who would need training on new financial products, but already deals with financial products and retail sales. The profitability of postal banks worldwide shows that any new investments in equipment and training would be quickly repaid. F. How would it benefit me? If you use the new services, you would have access to services for all your banking needs in your neighbourhood or community – where many have either had no bank or credit union, or perhaps only one other banking service to choose from. Postal delivery workers could also be equipped with a tablet to help with some of your banking needs if you were unable to leave your home or could not use online services. If you do not use the services, you would still benefit because postal banking would support the economic development of your community and your country, especially helping local citizens get fair rates and helping local businesses access services they need. Also, postal banking would help guarantee the postal services we have now and even help expand them. G. Who would use the services? Research carried out for the Government of Canada's Postal Service Review Task Force in 2016 29 showed that, even without having all the details or being able to see how exactly the postal financial services would work, a large number of Canadians wanted to use them. Eleven percent of Canadians say that they would definitely use some financial services at Canada Post. There are 29.65 million Canadians over 18, meaning that 3.26 million Canadians would immediately be interested in the new banking services. 30 The 7 percent of Canadians who said a definite yes to using full banking services at the post office, plus the 22 percent who said they would probably use them, means some 2.075 million Canadians could soon have accounts at the postal bank, with another 6.5 million Canadians as probable users. Since 47 percent of Canadians said new banking products were a good or excellent fit for Canada Post, the future for increasing the above numbers looks excellent. The 27 percent Indigenous support for adding banking services was also very encouraging. Finally, the 39 percent of business support and 11 percent of businesses committed to using postal banking services would make a Canada Post Bank one of the top business banks in Canada. There are 1.17 million businesses 31 (small medium and large) so an 11 percent of businesses using the services would mean 128,700 businesses ready to use postal banking services. H. Postal banking could become the anchor of many other additional community hub services offered in the post office location. Drop off and pick up points for fresh healthy food. Most people would like to eat healthy food but for many it is difficult to obtain in their community. The post office could serve as a regular weekly drop off point for fresh food baskets at reasonable prices. Because of the number of people who want to use banking services, and because of the revenues that can be made even while offering better and less expensive financial services, the postal bank can become the anchor for these other roles, cementing the long-term place of the post office within the community. Fourth, if your labour council or your union or your community organization or NGO has not passed a resolution in support of postal banking, get one passed. Fifth, if you need a speaker on this topic, please let us know and we will try to help you.